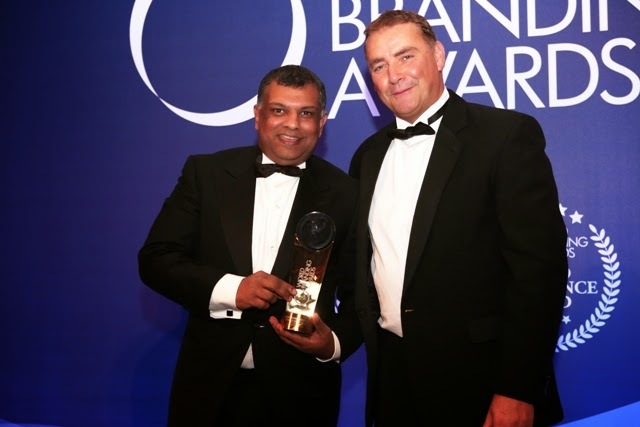 LONDON, October 28, 2014 – The 2014 World Branding Awards gave special recognition to Tony Fernandes, AirAsia Group CEO, naming him “Brand Builder of the Year” for his outstanding work in building the low cost airline brand. AirAsia was also named “Brand of the Year” in the airline category. The airline was the only regional winner, having scored the highest for a low cost airline in Malaysia, Singapore, the Philippines, Indonesia and Thailand. 68 brands from 25 countries were honoured at a glittering awards ceremony at the prestigious One Whitehall Place in London. Global winners include Apple, Coca-Cola, Del Monte, Heinz, HSBC, Louis Vuitton, McDonald’s, Samsung, Sony PlayStation and VISA. The 2014 World Branding Awards was organized by the World Branding Forum, a global non-profit organization which produces, manages and supports a wide range of programmes covering research, development, education, recognition, networking and outreach. It is also involved with research and development, the implementation of standards, best practice guidelines and tools, as well as other relevant branding initiatives. The awards recognized some of the best global and national brands for their work and achievements. Uniquely, winners were judged through four streams: brand valuation, consumer market research, public online voting, as well voting by the World Branding Forum Advisory Council, which is made up of luminaries from the world of branding.